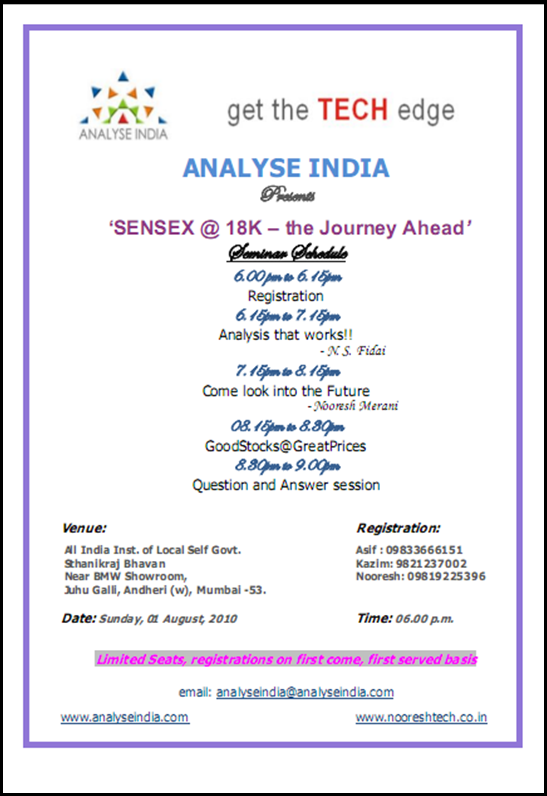 Please find attached the invite for the seminar – Sensex at 18k – the Journey Ahead – Free Seminar in Mumbai which is scheduled for 1st August 2010. Earlier editions in Mumbai, Ahmedabad, Pune, Delhi, Banglore, Surat, Chennai were huge successes and also we ended up discussing stock recommendations which appreciated in quick time. We would be glad to share a few more investment ideas, this time too!! 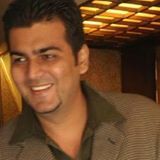 Interested people can contact Kazim 09821370002 Asif 09833666151 who would help you out with the registration process. Limited seats, so register at the earliest. Do invite your friends and colleagues. Pls try put video presentation of your seminar on the blog so that people who are not able to attend the seminar can not miss it. If possible pls give recommendations on your blog after you finish the Seminar. please tell me if nahar spinning is for long term. actually i bought it after i read about it in your blog and made good money when it touched 116 on Friday. kindly tell me its target. hi sir i am holding alphageo for past 2 months 550 shares @230 .its results are also not good this quarter. so please advice. Sir what is your view on Kajaria Ceramics at current level ? Please advice. Sir why Blue star fell so sharply. It has made high of 456.85 & came down to 425.55 in short time. Is it still hold or shall i exit. What is your view on Hind Dorr Oliver bought at 138 today? Will see if i can put the excerpts. I am aware of your sideways views on PSL LTD. However i would want to know if technical indicators can be manipulated to make a stock look sideways ??? Reliance Mutual Fund (accrd to disclosure made on 24-7-2010) bought more than 7 lakh shares in the period bwetween march 2010and 13 july 2010 and now hold close to 10% stake in the company. We all know how good reliance is in judging stocks in the indian market. So could it be possible that the technicals were made to look sideways so that they could accumulate ??? Strong fundamentals do not necessarily reflect in the stock price and sometimes its just the bias of holding a position tries to justify lots of things. Never get married to a stock. Sir why you are not replying my msgs. pls guide me in Bluestar. Dear Nooresh what is ur view on SKS Microfinance IPO.Kindly enlighten us over the same so that we can take an informed decision whether to apply or not. Hi Nooresh results of ionexchange have been declared today with a profit of 2.21 cr. Do you have any update on this.would you recommend profit booking. I have bought 2000 shares of Garden Silk Mills Ltd. @Rs.100 . Please guide me technically & fundamentally. You have not replied my querry Sir?. If you have bought the stock maybe u should have a fundamental or technical reason. Well hope u had a reason to buy the stock. Jamna auto industries at 52wk high. Jhunjhunwala involved in the stock. Some views on neo corp (neo sack) n cenlub ind. No idea on Jamna Auto. Whats your view on REI agro? Can one enter at 24 level? I would prefer to avoid the way stock is moving.